RAW Grow is an all-in-one formula of essential elements and bio-stimulants for optimal plant development. Tested and proven, this soluble nutrient blend can be use throughout the entire vegetative stage. 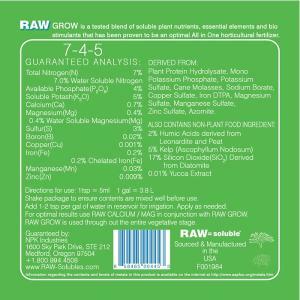 It is recommended to use a bit of RAW Calcium/Mag in conjunction with RAW Grow.